the command and support ship ABSALON. The gun is a Mod. 4, however the round shield is a Mod. 2. Denmark participates in the development programme, which should lead to the possibility of firing GPS guided rocket propelled grenates on ranges exceeding 100 km. 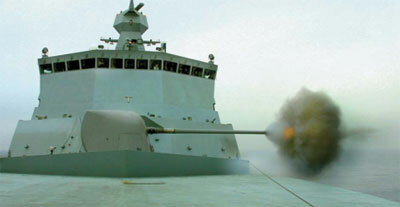 The three new frigates being built for the RDN are also fitted to carry this gun as standard. Delivery of the ships to take place 2010-12.